Impress your crew with a delicious homemade meal. Now the only question is – burgers or hot dogs? Pull up a lounger and work on your sun-kissed look. You're located right on beautiful Daytona Beach. 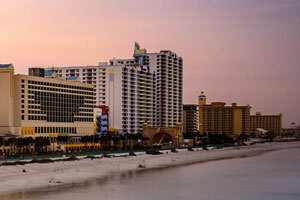 The resort is only a 20 min walk to Daytona Beach Boardwalk and Daytona Lagoon Water Park. The restaurants and bars at the Daytona Beach Boardwalk are just a short walk away. It's a 17 min drive to the Daytona International Speedway, home of the Daytona 500. Awarded a TripAdvisor Certificate of Excellence two years in a row, Sea Shells Beach Club is conveniently located right in the heart of Daytona Beach. After dropping off your luggage in your suite, have everyone change into swimsuits – there’s no such thing as too much sunblock – and get ready to hit the heated outdoor pool. Or take advantage of the proximity to the beach, where complimentary loungers and umbrellas are at your disposal. Catch up on that book you’ve been reading or check out the latest issue of People Magazine while the kids build a sandcastle. Borrow one of the resort’s bikes and go for a ride. The outdoor grills are perfect for a cookout. Recruit the little ones to help carry side-dishes, lay out the toppings and condiments and let everyone go wild. Studios at Sea Shells Beach Club sleep up to four guests. Kitchenettes come equipped with the basics: a mini fridge, two-burner stove top and a microwave. The kids aren’t expecting anything fancy, you are on vacation after all. Stock up on Hot Pockets and Bagel Bites at the Winn-Dixie Grocery Store, just over four miles from the resort. Flatscreen TVs with cable ensure that you won’t miss this week’s episode of your favorite sitcom. Let the kids each bring their favorite movies from home to watch on the DVD player – snacks optional (but recommended!). Bathrooms feature Bath & Body Works products. The on-site laundry facility is a definite bonus: extra space in your suitcase for souvenirs plus the added benefit of having one less thing to do when you get home. It’s a win-win! Even more good news, the resort has daily housekeeping so you’re off the hook in that department. Daytona International Speedway, home of the Daytona 500 since 1959, is less than six miles from the resort. Known as the “world center of racing” and with a brand new track (completed in early 2016), it is definitely worth a visit. Gather the shopaholics in your crew and head for Ocean Walk Shoppes, just a short drive from the resort. Maui Nix Surf Shop features a variety of apparel and swimwear. Create a custom t-shirt at Point Break Resort Wear. Treat yourself to a new pair of shades at Sunglass Hut. Brands include Maui Jim, Chanel, Ray-Ban and Tory Burch. Best Gift Idea Ever is known for their Letter Art made up of photos that feature “letters” in everyday objects. Hungry? Grab a burger and a hand-spun milkshake at Johnny Rockets. Forrest Gump fans will have a blast at Bubba Gump Shrimp Company. Enjoy delicious seafood, sandwiches and salads. Little ones will love the popcorn shrimp, pizza and mini corn dogs. Gluten-free selections are also available. Test your knowledge of the film with trivia and pick up a souvenir at the gift shop. Surprise the kids with a stop at Cold Stone Creamery for ice cream. Make it a grown-ups only night out at Mai Tai Bar. Try a Mango Mai Tai, Peach Elixir or Cucumber Melon Crush at the late night Happy Hour featuring live music. - Front desk is open 24 hours Tuesday-Saturday and 7:00 AM-11:00 PM Sunday-Monday. Guests that are planning to arrive after hours must contact the property in advance using information on the booking confirmation.